On Tasmania’s unsullied east coast, a bastion of design and luxury comes complete with generous hospitality, stunning views and inquisitive locals. Since opening in June 2010, Saffire is the place everyone’s talking about – even Southern Ocean Lodge, the stunning Kangaroo Island resort to which Saffire can most closely be compared, hasn’t been lauded to quite the same degree as this by our readership. So I felt compelled to check Saffire out and see why it’s getting such great word-of-mouth. Coastal Pavilions at Freycinet Lodge. Image via Eugene Hyland. The first thing you’ll notice about Saffire is that it’s a striking piece of architecture. Designed by architect Robert Morris Nun, Saffire comprises a series of 20 luxury villas with private courtyards, placed a discreet distance away from a monumental main lodge. It’s this building you’ll recognise from the photos – the lodge resembles a giant stingray-shaped spaceship that has gracefully landed in pretty native bushland adjacent to Freycinet National Park on Tasmania’s east coast, a 2.5 hour drive from Hobart. It is a remarkable structure inside, too. 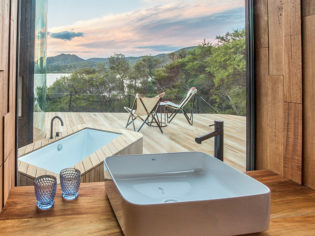 Panoramic floor-to-ceiling windows make an artwork of views across intense aqua water to the Hazards, a cluster of pink granite hills on the opposite side of Coles Bay. A curved cathedral ceiling creates a dramatic sense of space, while natural materials like honed marble and timbers such as Tasmanian oak, grey iron bark, celery top pine and recycled Sydney blue gum enhance the organic nature of the build. While some may wonder why you’d head to Tasmania for a luxury resort holiday when you could be in the Whitsundays, those who’ve been to this remarkable location will need little encouragement to go back. Freycinet National Park is home to some of the most dramatic coastal cliffs in Australia, as well as one of the country’s most beautiful beaches, Wineglass Bay. The Lodge itself sits among eucalypt forest fronting Great Oyster Bay, a white-sand beach scattered with rust-red lichen-covered boulders. But by no means is a stay at Saffire all about nature: the staff here are among the most genuinely friendly I’ve encountered (both in Australia and overseas). And they act on the little things – on a particularly chilly evening at the start of our stay, the photographer said a throw-away line about how perfect it would be to sit in front of the fire with a glass of glühwein. Next evening we climbed the stairs to find a vat of mulled wine bubbling away, ready and waiting for him. So the service, accommodation and scenery are all outstanding, but even still, my overwhelming recommendation for visiting Saffire would have to be the food, which is truly something special (see below). 20 suites ensure a maximum of 40 guests at any time. Deluxe suites are priced from $1750 per night (for up to two people). They are 80 square metres, and have a combined living/bedroom, double shower and bath, a courtyard and a sundeck with views to the Hazards, free wi-fi and an LCD TV. There’s plenty of board and beach games to while away the time at Saffire Freycinet. There are packages available that exclude dinner and beverages but I sincerely recommend going for the inclusive rate. You will want to eat and drink here for your entire stay. Even the lowest room rate includes breakfast and lunch,pre-dinner drinks, complimentary minibar and most activities, plus a $100 voucher for an in-house spa treatment. The four premium suites are priced from $2750 (including all meals and beverages). They are 140 square metres and have all of the above, plus a plunge pool, separate bedroom (with a second TV) and kitchenette (for $150 one of the chefs will cook for you in your suite and serve you at your private dining table). You also get a $200 credit voucher to use in the spa. Complimentary minibars are a blessing. Consume whatever you want without a worry (as long as you have it on site, and don’t scoop it into your suitcase). There are locally made snacks, wines, Cascade beer, and Lark Distillery vodka and single-malt whisky. Good luck finding room in your stomach, though. You’ve got multi-course breakfast, lunch and dinners to contend with, as well as afternoon teas of banana bread dropped into your room, pre-dinner drinks and canapés, and pots of herbal tea and handmade chocolates left in your room during the nightly turn-down service. 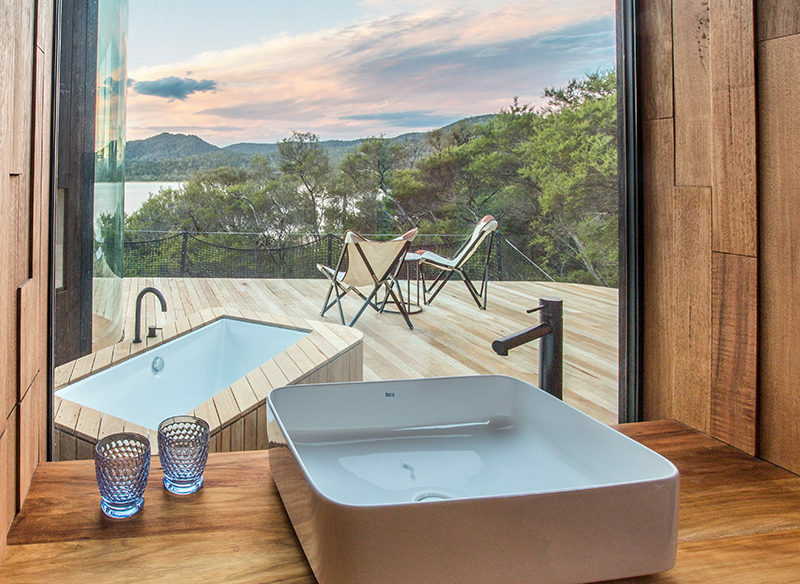 Saffire Freycinet: languid luxury for you, long guided walks and Tasmanian devil experiences for the kids. I love the communal lounge area. Bordered by a fireplace on one side and the view on the other, it’s a delightful space in which to socialise. There are traditional board games and chess boards (you’ll find chess boards in your room, too), as well as a wine aroma kit, which is a box of bottles filled with different scents. While rain fell down outside, we had great fun trying to guess what the contents of each bottle were. This is one of the few luxury lodges to welcome children of any age. While there’s no kids’ club per se, staff are only too happy to tailor activities to keep kids entertained. The Sapphire Lounge at Hobart airport is pretty special. It’s a big, airy, light-filled space with comfy lounges and complimentary tea, coffee and snacks where you can relax while you wait for your flight to be called. On site Saffire host Sandy is a delight – she can recommend things to do and see while you’re at the lodge as well as arrange transfers and make sure you’re good to go. Where is everybody? Look, I know Tasmania has only recently hit the travel hotlist, but if you want to tick off one of the best travel options in Australia, Saffire simply has to be experienced. The AT team visited in August and there were only a couple of other occupied suites. It was fantastic for us (we enjoyed one-on-one service in many instances), but presumably not so good for Saffire’s bottom line. The lack of guests is absolutely no reflection on the property itself, but more likely to be because it was winter, and many interstaters still don’t understand how great a Tassie winter can be. Happily, I’ve heard that the start of spring is attracting more guests again, but I’d hate to think Saffire might be empty again next winter. It would be an absolute travesty if a place like this couldn’t be a year-round proposition. It is a luxury travel experience to rival any in the world. Please go check it out for yourself. Freycinet Peninsula and Wineglass Bay from the air, Tasmania. If I have a complaint at all about Saffire itself, it’s that it doesn’t have a pool. Well, at least not a big, breathtaking communal pool. The four premium suites do have private plunge pools but they aren’t the most inviting or practical of set-ups. Resembling dark, narrow rectangular water features, they are hidden away in a private internal courtyard where bathers have nothing to look at but the fence (on the upside, they are heated – a blessing in winter). Meanwhile, while you submerge yourself in what unkindly could be described as a sensory deprivation tank, you’re fully aware that on the opposite side of your pavilion there is an utterly wasted, totally fabulous view. But really, in my opinion, the only way Saffire could be bettered is to install a huge, sculptural, infinity-edged communal pool that is sympathetic to both the architecture and the landscape. Self-guided activities include mountain biking, hiking, kayaking, archery and fishing (you can catch salmon, flathead and flounder straight off the beach). Complimentary guided activities include a tour of nearby Freycinet Marine Oyster Farm, a two-hour walk to Wineglass Bay, wine tastings at Freycinet Winery and bird-watching at Pelican Bay. You can also go behind the scenes in the kitchen for a chef’s cooking class and learn how to create great cocktails in a mixology class. Four signature experiences cost extra but deserve the extra outlay. There’s a three-hour adventure cruise out to uninhabited Schouten Island, which is also part of Freycinet National Park ($250pp). A full-day Schouten Island experience promises an encounter with the resident Australian fur seals ($450pp). For thrill-seekers, there’s the Great Oyster Bay Blast, an hour-long hoon around the bay to Moulting Lagoon and Hazards Beach ($110pp) or a half-day quad-biking expedition along 4WD tracks through the National Park to Friendly Beaches ($150pp). I did this last one, and I can report that I am not going to be doing Angelina Jolie out of any action movie roles any time soon. I could blame recent rains that caused multiple washouts (we had to turn back before we got to Friendly Beaches because one river crossing was too deep) but the truth is I drive like a grandma. It was great fun though, once I loosened up.